These are usually boots I can stand in forever, but not today. The boots however are not to blame. It's the socks. They're real cute & stripey & kind of Wicked Witch of the East looking, if you were watching the movie on an old black & white t.v., but not so comfortable with these boots. You can see me in these boots. These have been worn, unlike those boots that Dan Rather wore that time he posed for Texas Monthly, trying to still be all Texas & everything, leaning back in a chair on a front porch somewhere, feet propped up on the porch railing, bottom of the boots facing the camera. Bottom of new boots facing the camera. Like I said, I've worn these boots. I've had them polished on the River Walk in San Antonio and in Jackson Square in New Orleans. I've had passes made at me by men and women because of these boots. I've played in them & I've worked in them. I've even painted in them - you can see a splash of white paint on the right boot. They are old friends. They understood when I had to take them off today. I do see that speck of white paint! Gives them character. Like their owner, of course. Yes, I can see you in those boots even when you're not physically in them! Those are great boots full of life. One does question the authenticity of Dan Rather in that photo. We all know who the real cowboys are and who are the 'posers'! Oh I love these boots! and even more I love the story that goes along with them. mmm, these boots are made for walking. I've been thinking about boots lately...funny that you should post about this. I have never had an interest in owning them, and now, all of a sudden, I want to have a pair of boots. I have never had the guts before...you do need a certain kind of confidence to wear boots, and wear them well. And my lifestyle doesn't really blend well with boots. But I want a pair. My birthday is coming up in a few weeks...maybe I should splurge?? LOVE those boots. Love the idea of boots as old friends. 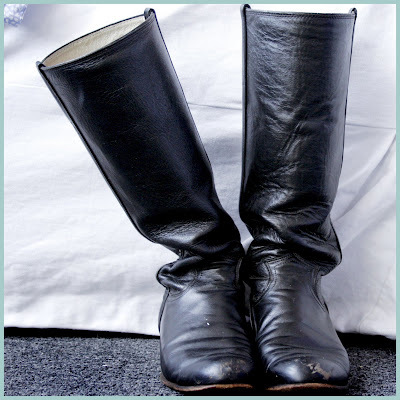 I once had a pair of black boots that were perfect. I wore them all winter long - for years. I had them resoled twice before the uppers finally just gave up. I'm still hunting for some new friends to replace them. Brenda - :) Character it is! Paula - Oh. Dan Rather. What a doofus. I can think of others who put on jeans & boots & think that makes them . . . well, I'll shut up. LOL! Jaime - You should splurge! Buy boots with a small heel or a flat heel. Justin Ropers are made for real cowboys to work in & come in all colors - you maybe could check them out. Raine - Welcome! They really are wonderful old boots. I need to have them polished up! Relyn - Just what I said to Suvarna. It's hard to say goodbye to old friends. Celeste - Unbelievably comfy. To Michael's dismay, I often wear them with no socks in the summer! Thansk everyone for loving my old boots! Debi - Great news. I had to come tell you because you will understand. I found my replacement boots. Jeffrey and I both looked for two years. Found them. Finally! I'll post a picture later. Just wanted to share a little piece of my giddiness.